SSI Subscribers and Senior Associates, airline passengers and pilots all would find it in their interest to become familiar with a new development that has just been published. As you may know from newspaper or television reports over the past few months, the Federal Aviation Agency (FAA) published a program-plan for its activities over the remainder of this century. The agency is promoting the plan vigorously, but it has prompted strong opposition, and as a result a good deal of news coverage, because it would be very expensive and the burden of cost would be felt directly by all (including airline passengers) who use the nation’s airspace. The cost burden would be felt by airline passengers in the form of a proposed 8% surtax on top of all airline fares. The operators of business, air taxi and charter aircraft (which carry about half of all passengers travelling on business-related trips) would feel it in the form of much increased fuel taxes and equipment taxes. The reason for the expense of the FAA’s proposal is that it is really an extension of a system which has been built up over the past 40 years and which is technically out of date. It consists of nearly a thousand “VOR’s,” which are radio navigation aids at various locations over the U.S.; thousands of special “ILS” Instrument Landing a dozen “ARTC” Air Route Traffic Control centers each with its own computer system. To receive navigation and approach information with the FAA’s system requires that every aircraft using the system must carry 11 different on-board instruments or electronics-boxes. The resulting high costs have seriously restricted the number of aircraft that can be fully equipped. The FAA proposes now to add still more ground-based and airborne systems for a total of 13, and the resulting expense will be about $20 billions, about twice (for comparison) the development costs of the Space Shuttle. It happens that for the past several years I’ve been working on a single new system that could replace all the FAA’s existing and proposed installations. It would consist of just three satellites and one ground station, in which there would be five computers, any one of which could carry the entire system load. Each aircraft would have to carry only one system instead of 13, and that one would be quite inexpensive. As a result, the country could be saved the new expenditure of $20 billions, no new taxes would be required, the cost of air traffic control could be reduced to much less than its present value (a further saving in the billions of dollars per year) and all types of flying would be a great deal safer. The new System, called “TRIAD,” because it uses three satellites, recently received patent approval from the U.S. patent office. All of a very broad set of claims were approved. Foreign patent applications are now in progress. The patents are in my name, but I have arranged that if revenues are ever received from the invention, 90% of the revenues will go to SSI. The “TRIAD” system has received enthusiastic support from a number of airline pilots and independent systems engineers. However, as might be expected, the FAA is cool toward it, although the agency has admitted that by the end of this century air traffic control should go over to some kind of satellite-based system. 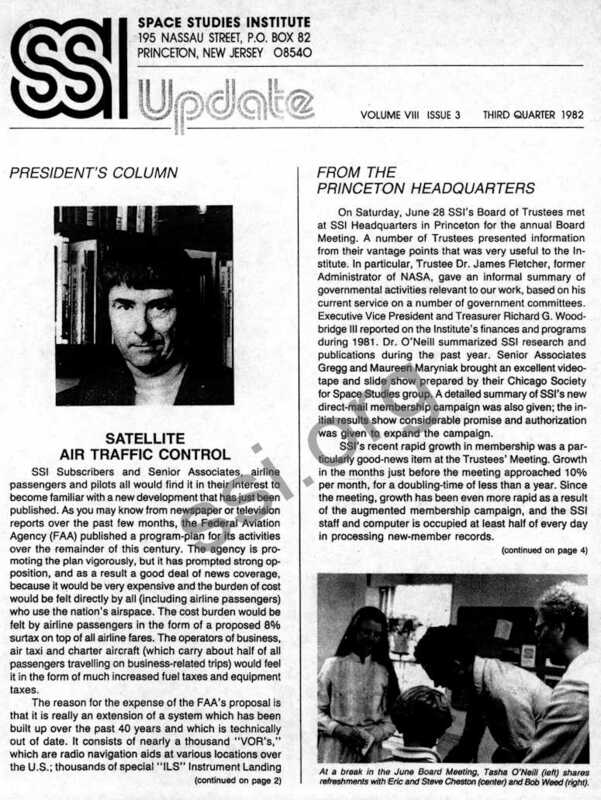 Recently the largest organization of non-commercial pilots, AOPA (Aircraft Owners and Pilots issue of its magazine, AOPA Pilot (July 1982) is a special issue largely devoted to the air-traffic control question, and features as a possible alternative to the FAA proposal a long article of mine on TRIAD. Reprints of the 16 page special section of AOPA Pilot are available from SSI for a $1.50 handling charge each. One of the most helpful activities for all of us who support SSI would be to alert lawmakers to the existence of TRIAD as an alternative to the FAA plan, and to point out to them that if it is adopted it can save the nation a great deal of money, make all forms of air travel a great deal safer, and give a vigorous boost for new growth of the nation’s commercial and business aircraft industries and airlines, which are in a disastrous state of recession. The patenting of the TRIAD system is the first, but we hope far from the last, example of a general policy that SSI is pursuing: that is to encourage and to patent inventions which can benefit the public and which have a chance of returning revenue to SSI for the support of its future research. Although my research which led to the TRIAD system was done at no cost to SSI, we at SSI Headquarters are particularly alert to patent opportunities which may arise out of the research that SSI funds. At the same time, our choices of what research to fund are and will be made entirely on the basis of their potential for a rapid opening of the High Frontier of space for the improvement of the human condition. 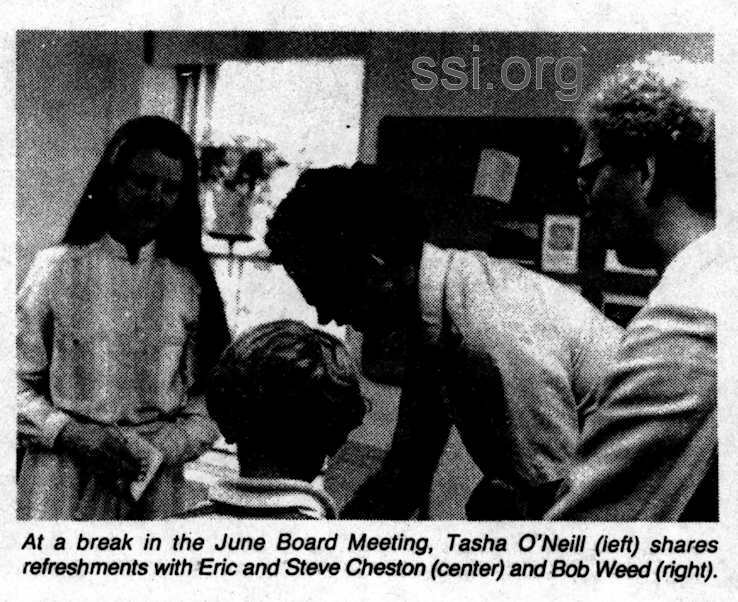 On Saturday, June 28 SSl’s Board of Trustees met at SSI Headquarters in Princeton for the annual Board Meeting. A number of Trustees presented information from their vantage points that was very useful to the Institute. In particular, Trustee Or. James Fletcher, former Administrator of NASA, gave an informal summary of governmental activities relevant to our work, based on his current service on a number of government committees. 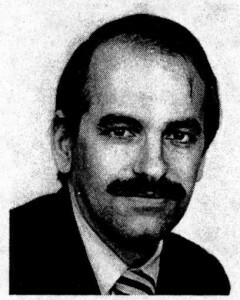 Executive Vice President and Treasurer Richard G. Woodbridge III reported on the Institute’s finances and programs during 1981. Dr. O’Neill summarized SSI research and publications during the past year. 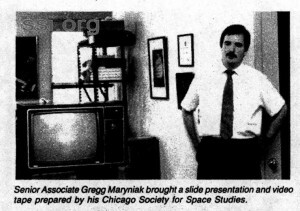 Senior Associates Gregg and Maureen Maryniak brought an excellent video­tape and slide show prepared by their Chicago Society for Space Studies group. A detailed summary of SSI’s new direct-mail membership campaign was also given; the initial results show considerable promise and authorization was given to expand the campaign. SSI’s recent rapid growth in membership was a particularly good news item at the Trustees’ Meeting. Growth in the months just before the meeting approached 10% per month, for a doubling-time of less than a year: Since the meeting, growth has been even more rapid as a result of the augmented membership campaign, and the SSI staff and computer is occupied at least half of every day in processing new-member records. The Trustees also discussed the misuse of our service mark and trade name, “High Frontier,” by a military group. We appreciate the letters and copies of articles that you’ve sent, showing such unauthorized uses of the “High Frontier” mark. Please continue to forward any examples you come across in letters, magazines or newspapers. You can also take useful direct action by immediately writing a letter of protest to the editor of any publication which prints “High Frontier” in any context except to describe the work of Dr. O’Neill and SSI. Such letters are generally useful only if mailed immediately after the publication has appeared. We are also pleased to announce a new Trustee who joined us in July, 1982. Dr. Brandt Goldsworthy is President of Goldsworthy Engineering, Inc. of Torrance, California. He is the leading expert on automated fabrication of composite structures. this time, because the Institute is providing total support both for the Chemical Processing and the Mass-Driver research programs. Therefore any additional funds for this project that you can contribute will be of great help. Check the category on the coupon on page 5 and enclose it with your check or money order. As you know, the main source of research support for SSI is the Senior Associates, who contribute from $100 to . ·$500 or more per year to SSI on a five-year pledge basis. The Associates are increasing in number very rapidly, and currently number almost 700. 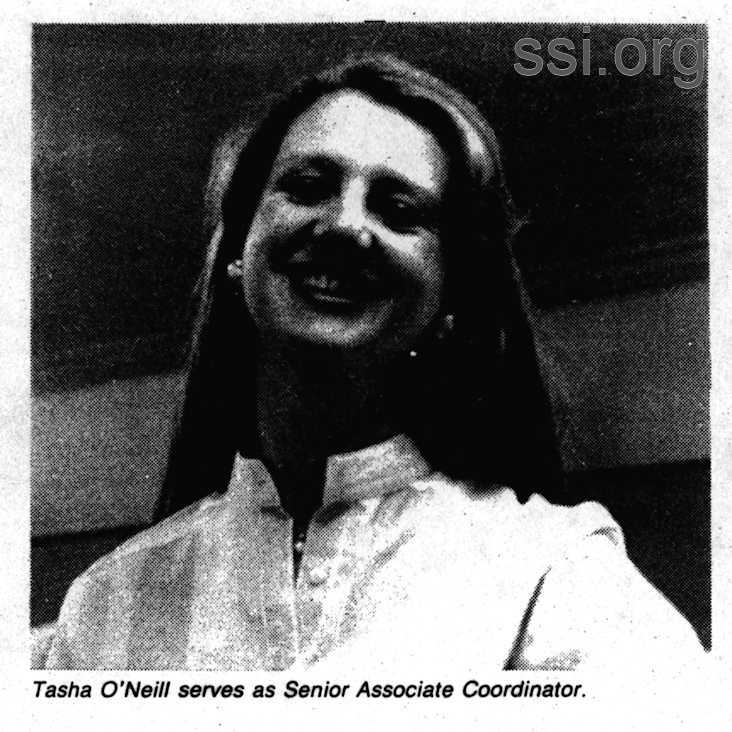 In recognition of their commitment to SSI the Institute recently sent to all Senior Associates a specially bound information package, and Dr. O’Neill regularly sends the Associates detailed Confidential Newsletters concerning the Institute’s research and other activities. Senior Associates also receive a copy of the NASA publication Space Resources and Space Settlements (SP-428). If you are already a Senior Associate and would like a copy of SP-428, please send us a postcard here at the Princeton Headquarters. 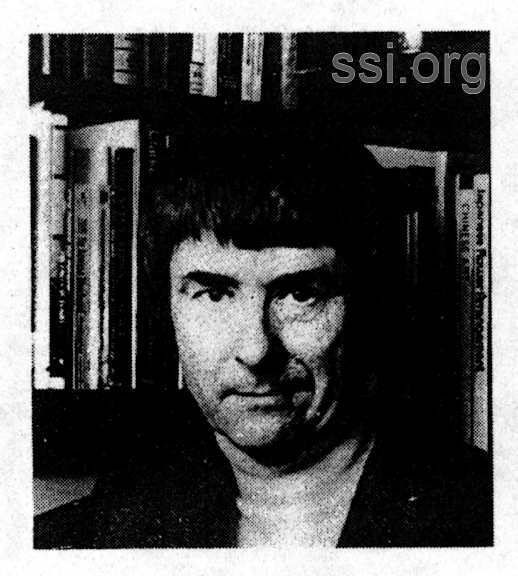 The book is a compendium of technical papers from the 1977 Summer Study that Dr. O’Neill directed at the NASA Ames Research Center. Several Senior Associates have elected to give their contributions through the United Way. Under this plan the Associate’s employer sends the contribution and the appropriate form to the local chapter of the United Way, which divides it up and sends the pledges to the various named recipients. However, while SSI is tax exempt and non-profit, we do not qualify as a human health or welfare organization under the policy restrictions established for United Way AID. Please check with your payroll office if you have set aside an SSI contribution through United Way. And here you thought all the Space Studies Institute did was leading-edge research designed to build space manufacturing centers and colonies. Well, that’s what we do most of the time. But now we’re running a contest. A fun one, but with a very serious goal. 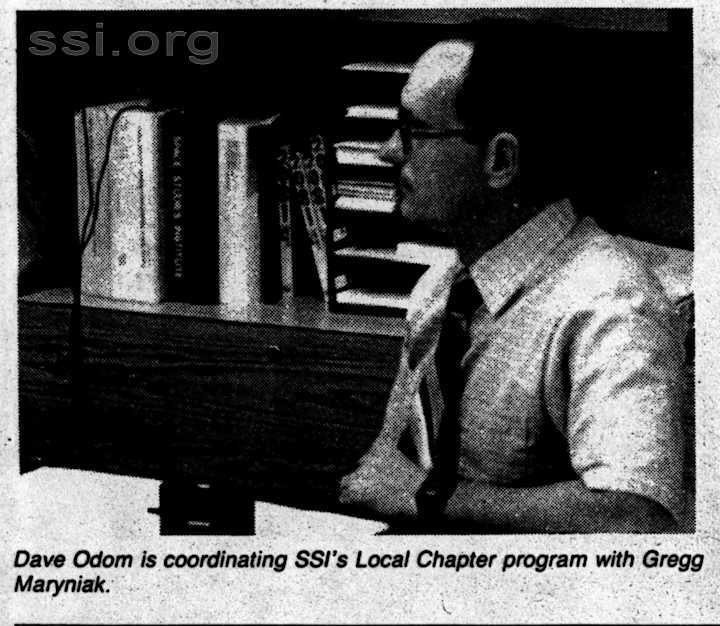 The contest is to see which SSI Member can recruit the largest number of new members by November 1, 1982. As a SSI Member, you are eligible to enter. All you have to do is to let us know how many new member packets you want. We’ll send them to you. The kits have a copy of “Update,” SSl’s great newsletter, and other background material on what we’re up to. In turn, you ask friends and others who like space to become Sustaining Members with a donation of at least $15. Will you enter the contest and promise to recruit at least three new members? Oh; that’s right, we said “contest.” There’s a prize for the SSI Member who recruits the largest number of new SSI members: a full color, framed NASA print; and special recognition in the November Newsletter. Doesn’t that sound nice?. An award for your help . and special recognition for expanding public support for the Space Studies Institute. Sorta makes you feel good already, doesn’t it? Grab your pen or pencil and fill out the coupon on page 5. Return it to Abbe at the Princeton office and We’ll send you your contest recruitment kit. Sorry, no secret decoder rings. Dr. Klaus Heiss has conducted major project evaluations of new technology systems for several U.S. Government agencies. 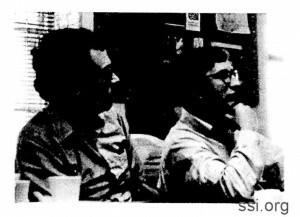 His active involvement the Space Shuttle program dates to 1971, the year in which he and Professor Oskar Morganstern prepared a seminal memorandum for NASA administrator Fletcher entitled “Factors for a Decision on a New Reusable Space Transportation System.” In 1979, Dr. Heiss joined with Wm. Sword and Company, Inc. to found The Space Transportation Co. Inc.
For those of us with an interest in the American space program, the 1970’s were a time of awakening. Space policy in the past decade was largely confused and undirected, with. the result that much of the technological industrial aerospace capability built during Apollo was dismantled. We were reminded that a healthy space program was not a natural event that “rains down” on the U.S., but something which needed to be directed by strong goals actively defended by partisans with clear vision. The next two decades hold tremendous opportunity for the U.S. in space if the mistake of the 1970’s is not repeated. At the highest levels of our nation’s leadership; there must be – and I believe there is emerging – a recognition of the potential benefits of space in the next decades and a commitment to the realization of those benefits. The key to the long-term realization of those benefits is the optimization of the present U.S. Space Transportation System (the “Shuttle”). At this writing, the space transportation system designated to serve the nation until the year 2000 is limited to four vehicles. Within the next year, the production lines for long-lead Shuttle Orbiter items will begin to shut down – and once they close, the lines cannot be opened again except at great cost. The Space Transportation Company (“SpaceTran”) was formed in 1979 for the purpose of determining whether the private ownership and operation of a fifth Orbiter would be economically feasible. The Company was formed in the belief that the private sector could efficiently expand the capacity of the STS while serving the needs of commercial/non-U.S. Government users worldwide. While our studies are not complete, it seems clear at this point that conceptually private ownership of a fifth Shuttle Orbiter is feasible. Earlier this year, SpaceTran submitted a proposal to NASA concerning the private funding and marketing of the capacity of Orbiter V. That proposal stated that a fifth Orbiter would provide many important benefits to the space transportation system, among which are: the ability to meet future growth in demand for space transportation by commercial users; the provision of a hedge against any catastrophic losses or operational difficulties of the first four Orbiters; the beginning of an increased presence of United States aerospace capabilities in world markets and an improvement of the nation’s balance of payments; and the potential of more cost effective shuttle operations due to the technological improvements in Orbiter V and subsequent orbiters. But the real advantage of the SpaceTran proposal to fund and market the capacity of Orbiter V is its potential effect on the future of the American space effort. The failure ­ which I have already mentioned – of the United States to build significantly on its space technology base in the late 1960’s was the result, in large part, of NASA’s not having been given significant new space goals (space transportation systems are means and not goals). With the space transportation system, enhanced by the SpaceTran proposal, the United States has the means to pursue space systems with massive economic, technological and scientific implications. One such system would be a large-scale technology base in geosynchronous orbit (GEO). Such a base could sweep in an economic revolution of space and ground communica­tion systems, switching capabilities in space, applications in both developing and industrial countries, information processing, and operational support for spacecraft missions in many other orbits. The possibilities are endless. A goal like the large-scale technology base is not possible without a restructuring of NASA. NASA should be reestablished as a research and technology development center, freed from the responsibility of systems operations and applications. Many people familiar with NASA consider the weight of applications/operations a debilitating influence on the agency – a factor which has inhibited rather than spurred progressive thinking. The SpaceTran proposal and others like it, I believe, will give NASA the opportunity to return to a primary R&T role and will signal the diversification of the mature United states presence in space. With this step, America will reap the benefits of a space program which is a principal component of its technological, economic and foreign policies. With this step, the United States presence in space will reflect its system on earth-a system in which the private sector, free enterprise, grows in an atmosphere of innovation and progress. Please send me the following items. Enclosed is my check or money order in US funds. ___ YES, I understand the importance of expanding SSI’s Membership base. The Institute’s work is critical and you need the support of more concerned people to keep at it. [ ] Send me ___ Sustaining. Member recruitment forms. That’s the number of people I will personally try to recruit as SSI Sustaining Members. Who needs a form? Here are checks or money orders from ___ new SSI Members, all of whom have joined with at least a $15.00 donation. This Conference is jointly sponsored by the Princeton University Conference Office, the American Institute of Aeronautics and Astronautics, and the Space Studies Institute of Princeton, New Jersey. The Organizing Chairman is Dr. Gerard K. O’Neill, Pro­fessor of Physics, Princeton University and President of SSI. The lecture schedule often changes, so it is wise to check with the University or College where a lecture is given, before going, to make sure of the date and time. All of Or. O’Neill’s college/university lectures are given on an. all-campus basis, so it is generally best to check with the Lectures and Concerts office at the institution you are planning to visit.